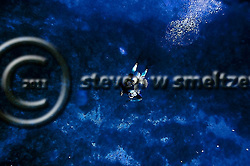 Molokini Crater is one of the best dives if not the best dive on Maui. This scuba diving site is only accessible via boat and is at the remnants of an extinct volcano. The crescent of the volcano “cone” rises above the sea some 165 feet. The small island lies in the Alalakeiki Channel between the islands of Kahoolawe and Maui. The opening side of the crater faces the northwest and only a short boat ride from the Wailea side of Maui. If you are interested in some of the history around Molokini Crater there is a short article written by Edward L Caum, Geology of Molokini and published in 1930. There are a couple of “plate” photographs included in the arti cle and it is interesting to compare to the crater today. Molokini Crater has been a Marine Preserve(MLCD) since the summer of 1977 and features one of the most pristine hard coral reefs in Hawaii. The ride from the Lahina side of the island takes about 45 minutes and if you tend to get sea sick, I would recommend driving about 45 minutes or an hour to the Wailea area where you can take a very easy boat ride to the crater. I prefer scuba diving with Lahina Divers but you must take about a 45 minute boat ride to the Molokini crater. If you want you can use a scuba diving operator that leaves from the Wailea side of Maui. If you are staying in Wailea I would certainly recommend this, although the boats tend to be smaller and there is one operator on that side that I simply refer to as the “Scuba Nazi”. So be careful of the operator that you choose. Make sure you check out the reviews and the equipment used by each of the dive operators. The v-hull boats that leave the Wailea area can be quite cramped if the number of divers is more than 10 on the boat and on many of these there is little if any room to move around. Access – Moderate to Moderately Difficult to reach the site; boat only (You should not take a boat from Lahaina if you get seasick – 45 minute boat ride); Much easier ride from Wailea side. Scuba Diving Molokini Crater is certainly the best boat dive on the island of Maui. You have to go to Lanai or Molokai to find better deep water scuba diving sites. The clarity of the water is usually quite good at Molokini and there are a several dive sites on the volcano on the outside of the crescent shape crater and on the inside of the crater. For inside the crater I like the Eastern edge – Enenue. 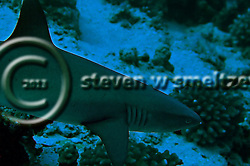 At about 120 feet there is a series of overhangs that tend to house several White-tip Reef Sharks. 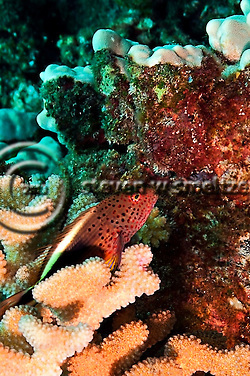 As you are swimming down and back up after visiting the “condos” there is a good variety of marine species. 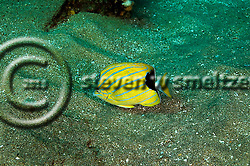 You will find typical butterflyfishes, wrasses, damselfishes, eels, and crustaceans all around the crater. You will also find sea turtles on a regular basis and on a very rare occasion humpback whales have been seen by scuba divers at Molokini crater. The current can be quite strong on the outside edges of the crater, so do not go outside the crater for any reason if your group is scuba diving the “inside”. The current at the edges can take a diver quite a distance in a very short period of time. For this reason you must take a safety sausage with you on this dive and know how to use it. If you are scuba diving the inside of the crater you will rarely have much if any current and even if the seas are choppy the cone of the volcano protects the inner dive sites quite well. 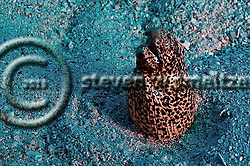 In the sand flats of the crater you will often find Freckled Snake Eels, so take your time on this dive and also make sure you “look” into the distance often as you can see various types of sharks and on especially amazing dives you may even see a Humpback Whale. If you are diving in whale season (December to April/May) make sure you listen for the whale song. In February to early April I have heard literally dozens of whales singing to each other. It certainly makes the dive a lot more interesting. 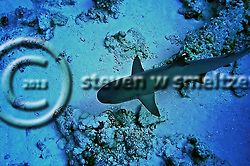 Follow this link for other Hawaii Dive Site Reviews.